The tube hybrid TUBE DAC II DA converter from ACCUSTIC ARTS® was introduced in 2007 and has since enjoyed a lot of success and received numerous awards. Now the converter has been fundamentally revised to offer the additional possibility to play direct stream digital (DSD) music data. As with the previous model, the MK 3 version is also equipped with numerous excellent connection possibilities and plays a number of different digital sound formats. 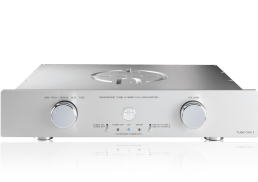 The important features of the TUBE DAC II – MK 3 include 5 digital inputs (XLR, 2 x coaxial, optical and USB). The USB input works according to the latest asynchronous 24/192 technology and is compatible to DSD. In the playback of different music formats customers can choose between native signal processing or upsampling to 192 kHz. An integrated preamplifier section with volume control enables direct connection of the TUBE DAC II – MK 3 to a power amplifier.